Winter Park, Colorado and its rich natural resources first supported the Arapahoe and Ute tribes, and then attracted the mountain men that ventured over Berthoud Pass in the early 1800's. Though the Ute and the Arapaho tribes made 'Middle Park' their home as early as the mid 1400's, the history of Winter Park, Colorado was shaped by the early pioneers and settlers that were brave enough to carve a home out of the untamed wilderness and harsh winter conditions that lay beyond Berthoud Pass. The advent of the railroad and its access into Grand County via the Moffat Tunnel helped the masses discover the Winter Park area, where thousands came to pursue a fresh start in the late 20's and early 30's to take advantage of logging, agriculture and livestock opportunities. Given Winter Park's annual snowfall (usually over 300 inches! ), Grand County was one of Colorado's first areas to enjoy 'sport skiing'. Early settlers made sport of cross-country skiing and snowshoeing until the first ski jumps were built in Hot Sulphur Springs in 1920, and then the first tow lift was built on the top of Berthoud Pass in 1936. They have both been since replaced by the world-class slopes of the Winter Park Ski Resort, established in the late 1930's. The Winter Park area is now a mecca for skiing, both alpine and nordic, along with mountain biking, hiking, fishing, snowmobiling and countless other outdoor and indoor activities. Located between Winter Park and Fraser, the Cozens Ranch once served as the first US Post Office and the first stage stop past Berthoud Pass, as well as being the earliest homestead in the Fraser Valley. Completed in 1928, this six mile tunnel was blasted through James Peak and the Continental Divide to overcome the dangers of operating trains on the treacherous tracks over Rollins Pass. Its west portal is right near the Winter Park Ski Resort. Ride in style via passenger cars pulled by a steam locomotive! 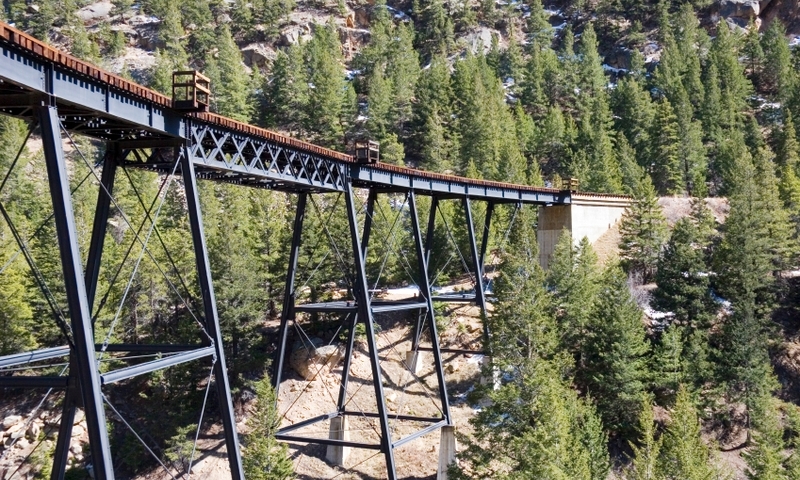 The Georgetown Loop Railroad offers you a glimpse into the area's illustrious gold and silver mining operations near Georgetown and Silver Plume. Pan for gold in this historic mine! Located in Clear Creek County in Idaho Springs, you can tour the actual site where the 'Phoenix Vein' gold streak was found in 1870. This museum building was once the Hot Sulphur Schoolhouse, built in 1924, and Pioneer Village also consists of several buildings built in the late 1800's, including the original Hot Sulphur courthouse, the county jail, a blacksmith shop, the "Horseshoe Ranger Station" and the 8 Mile School. Other artifacts, including early tools, clothing and information on Hot Sulphur Spring's ski area (the first in Grand County!) can be found here. The Grand County Historical Association offers a full history of the area at the Grand County Museum. A complete history of Grand County, Colorado.